Is There (still) No Such Thing as Bad Publicity ? CBC Radio 2 is swarming in publicity, or so it would seem. Newspapers are writing stories, bloggers are blogging, readers are commenting, and even the VP of CBC English Media is using the internet to give his side of the story. If you don’t work at CBC or listen to Radio 2, you probably have NO IDEA what’s going on. People are pissed about what’s happening to classical music on the network (that’s Radio 2) and more recently, the axing of the CBC Radio Orchestra. Apparently there are thousands and thousands of Facebook members who’ve joined groups to show how pissed they are at the changes. 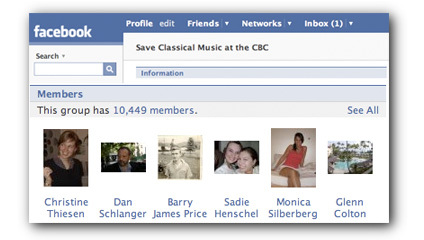 This blog fight over classical music is also getting ugly. Meanwhile, the arrows are flying back at InsidetheCBC over the corp’s comment policy. Now that CBC is instituting a 7 day window for comments, that shouldn’t continue to be a problem. All this fuss over classical music ? I should tell you that I created and produced my share of shows on Radio 2. And you know, all of them were the dreaded pop music shows. There was a music magazine show called The Beat that we created and produced here in Vancouver that aired on what was then called CBC Stereo. That was followed by RealTime, another pop music show, live to all time zones, that aired on Saturday nights. We played tons of indy music and recorded all sorts of bands across Canada. Actually, to be accurate, if there was an indy band in Canada that so much as had a recording, we played it. When we first started Radio 3 in early 2000, we also produced over 30 hours a week of pop music shows on Radio 2. So, this idea that pop music has never been represented on Radio 2 is a bit of revisionist history. In fact, the people who are making the changes now to Radio 2 are the same people who pulled Radio 3’s pop music shows off the network in the first place. But I digress. Back in the RealTime days (mid 90’s) and during the advent of Radio 3 (early 2000’s) we would have done anything for this kind of publicity. Goodness knows we tried. We recorded scores of bands at festivals across the country every year, we said bad words on the air (just ask the bad boy from West Van Grant Lawrence, who used to love to drop the F bomb whenever we would interview him on the road). We won tons of international awards for our web sites – even CBC’s own PR department refused to tell anyone about them – apparently winning too many awards is not good form (or maybe there’s such a thing as too much good publicity). We even got our shows canceled. More than once I might point out. Ok, that’s not true, I think once the Toronto Sun mocked us for thinking we could make CBC ‘cool’. But compared to what’s going on this week, bubkis, bubkis, bubkis. So, I have to admire the notion that a media storm has developed over the changes to Radio 2, and over the indelicate evisceration of the venerable CBC Radio Orchestra. Radio ratings should go through the roof. But when I look a little deeper, I’m not entirely sure this is exactly the Perfect Storm of a publicist’s wet dreams. The mainstream papers seem to have picked up the orchestra cancellation story, but they aren’t going much deeper than that. A quick search at the Globe and Mail turns up only a couple of stories (behind a pay wall). The National Post, a paper that loves to mock the CBC, seems totally disinterested. And citizen journalism sites like Orato and NowPublic, both based in Vancouver, have no coverage to speak of. So it would appear that citizen journalists could care less. Maybe the Perfect Publicity Storm is just a little squall. Maybe the CBC didn’t need to drop a bundle on full page ads in the Globe. It would have saved them the embarrassment of putting non-classical musicians in the unenviable position of trash talking their classical counterparts. Like that’s a good idea. (click the image for a larger version courtesy InsideTheCBC.com). More likely, it’s only a Perfect Storm inside the CBC itself. As my former CBC boss and mentor used to say “they do love to drink their own bathwater”. Swell image that. We’ll see how a planned ‘protest that isn’t a protest‘ goes on Tuesday outside CBC Vancouver. My guess is that this will all blow over pretty quickly. By the time Radio 2’s new schedule launches in the fall, the whole thing will have been forgotten. The blogosphere will have discovered something new to be upset about, and he Facebook phantoms will have tired of poking one another (even though some of them are pretty hot). Jennifer McGuire, the woman who runs radio now, will be well out of the picture, and in her new job running news, so there won’t even be anyone left to blame. And sleepy old Radio 2 will go back to obscurity.